Many organizations have a difficult time dealing with poor performers. This could be for a variety of reasons. The management staff may not like the conflict. The poor performers might also be well liked by the staff. In many cases the managers might prefer to try to work with a poor performer that deal with the disruption of turnover. In organizations where poor performers are allowed to remain, the level of productivity suffers and morale can take a hit. When organizations impose no checks on performance, top performers sometimes leave because they do not see their contribution rewarded any more than poor performers. With only mediocre employees staying on, the work culture evolves to accommodate mediocrity. This has a damaging, long-term effect on productivity and the entire organization. There are a number of things that can be done. The only good thing about poor performers is that they are usually easily identifiable. They arrive late, leave early, miss deadlines and find excuses for their inconsistencies. Their colleagues are left to make up for their performance. If you are honest in your evaluation of staff members, the poor performers are not hard to spot. Many organizations end up firing poor performers. In many cases it is deserved and necessary. Considering the costs of selection, recruiting, and training, this can be a costly way out. However, you need to be prepared for this step or the truly poor performers will remain despite your best efforts. Before a person is fired, it is usually worth while to see if they can be turned around. This might include an additional investment of time and money. This starts with a recognition of the outward signs of poor performance, an analysis of the causes of the poor performance and a plan to try to resolve the problems. Sometimes this includes training. Sometimes it could be mentoring. In some cases, just making people aware of the perception can be enough to change behavior. 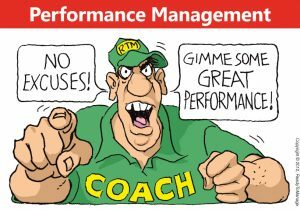 Some managers are not able to manage poor performers. As mentioned earlier, some managers do not like to deal with conflict. Some managers go overboard in confronting employees – threatening poor performing employees in ways that can be disastrous for the entire team. Some managers make the mistake of reprimanding the entire team instead of just the employee. Some managers get used to poor performance and don’t recognize it any more. Training managers to deal with poor performers will add the much-needed skill to their existing managerial toolkit. This allows managers to deal with performance problems in their staff in a positive, constructive way – while being sure that the poor performance is addressed to the benefit of the company.